LockTec is one of the leading electronic locker manufacturers worldwide. The company has been developing and producing patented locker solutions for a wide range of applications for more than 35 years. More than 50,000 lockers, installed in 30 countries, speak for themselves. LockTec is part of a medium-sized, owner-managed group of companies in Weissenbrunn in upper Franconia, Germany, with over 100 employees. Like the parent company SITEC, LockTec attaches the highest importance to the quality feature "Made in Germany”. We plan and project manage your locker system right up to networking. The locker banks will be manufactured using the latest technology in accordance with your requirements. We deliver and install the locker bank and train your employees. Even after delivery we are happy to help. Locksafe is the smart locker system for any public area. These public lockers are used wherever luggage of various sizes needs to be stored safely. A sturdy outer housing, double-walled doors and multiple locks ensure high security and protect against vandalism or theft. One or more electronic locker systems can be connected worldwide via a network to a centralized management server. As a result the keyless lockers Locksafe offer centralized control as well as monitoring of the systems round the clock. Secure luggage storage provides freedom and mobility when shopping, sightseeing and touring. Multilingual menus at the paypoint guarantee simple operation. Hire charges can be paid using coins, notes or cashless payment. Battery charging cabinet: Lockers with integrated power chargers can be used to charge electronic devices. In addition to cooling and freezing modules, cool lockers can also be equipped with heated compartments. The smart locker software also enables one system to be used by different suppliers at the same time. Refrigerated lockers are the latest trend! Your customer orders goods online on your website, simply by phone or in person at your store. You prepare the goods and put them into a refrigerated locker at the customer's requested time, ready for pick-up. Your customer collects the goods conveniently at the cool lockers station– outside the opening hours and without queuing at a till. 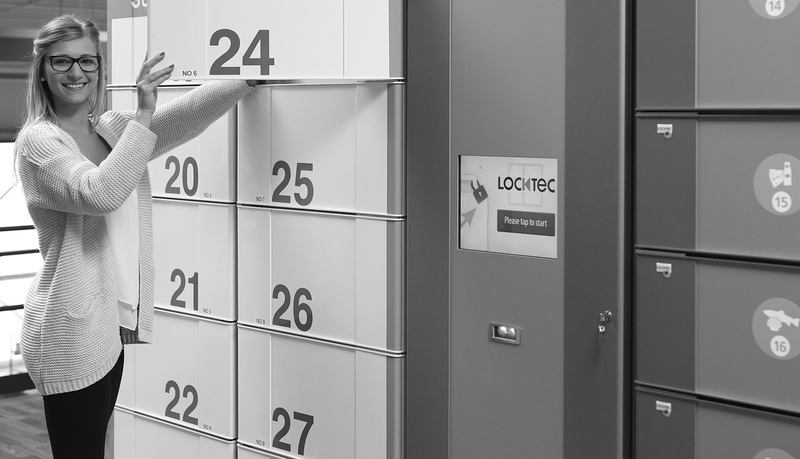 Servicebox is a delivery and collection station and LockTec's last-mile-solution. Whether as a parcel locker and package station for service providers or as a pickup station for end users - this special transfer system is used wherever packages and goods are to be handed over quickly, easily and round the clock. The smart electronic lockers can be used to facilitate transfer processes within a company or serve thanks to the Click & Collect system as a pickup point for customers. LockTec's smart parcel locker software allows the system to be used by different suppliers at the same time - multi-carrier system Servicebox. In addition, the smart click and collect lockers can be customized to meet your specific needs, making it extremely versatile. Faulty equipment is delivered to the electronic locker system. It is returned after repair via the lockers. The parcel service provider delivers parcels directly to the smart package lockers. The customer can then collect them from the click and collect lockers. Employees can collect their private parcels at the smart locker system. Real estate lockers with click and collect. Pickup station for parcels and services for flats, apartments and hotels. Every service providers can deliver goods via the smart parcel lockers - smart parcel locker software for multi-carrier function.